An ISU scientist is leading an effort to enter thousands of preserved specimens into an easily searchable online database that scientists all over the world can access. 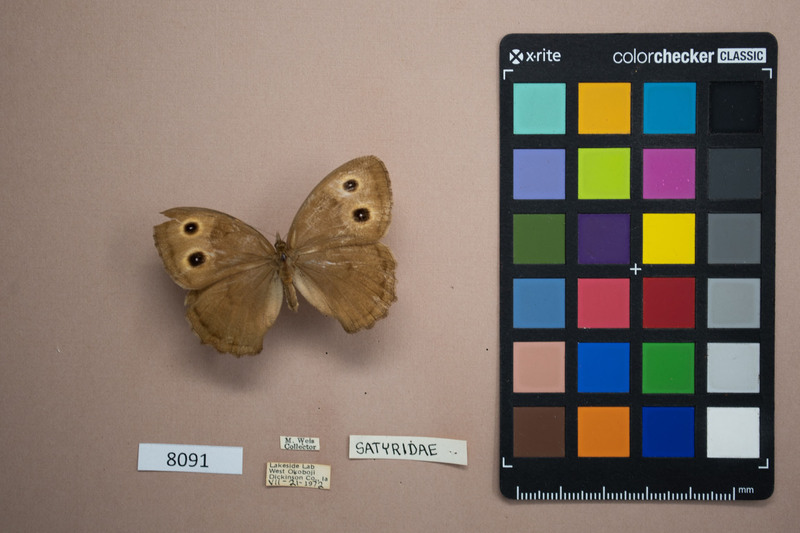 A website allows anyone to pull up photos from the collection, such as this one of a butterfly, and enter the information on the label into a database. Without such a database, “we have no idea what’s in these collections,” Lori Biederman said. Image courtesy of Lori Biederman. Larger image. AMES, Iowa – Calling all citizen scientists. Biederman spent time working at the Lakeside Lab over the summer, and said she started “poking around” in some of the cabinets. She found numerous preserved specimens from plants, birds and mammals. Biederman asked around and learned many of the records cataloging the specimens had been lost or never existed in the first place. Most of the specimens have labels, but there’s no central database to allow scientists to easily search the collection. So Biederman asked Sydney Weldon, an ISU senior studying biology, to take photos of each specimen in the collection. The photos were uploaded to Zooniverse.org, a website that provides a platform for volunteers to conduct research, and made available to the public last week. Anyone interested in contributing to the project can log onto the website and access photos from the collection. The volunteers then record the information contained in the labels in the photographs in a database. Cataloging a single specimen takes a few minutes, Biederman said, and each specimen will be shown to six volunteers to reduce data-entry errors. So what’s in the collection? Biederman said there are 910 nonvascular plants (mosses), 5,786 vascular plants and 365 birds. The collection also contains numerous insects, as well as 156 preserved skin specimens and 43 skull specimens from mammalian species. Most of the samples originate from species native to northwest Iowa, but some of the samples were donated to the laboratory after being collected in exotic locales decades ago. There’s no way to tell what you might find going through the collection except to examine each specimen one by one, Biederman said. Biederman said the loss of biodiversity the world has experienced in recent years makes efforts like this, to record and disseminate the contents of the collection via an easily searchable database, even more important. Citizen scientists can contribute to an effort to enter thousands of preserved organism samples from the Iowa Lakeside Laboratory into an easily searchable database. An ISU scientist overseeing the project said there’s no telling what kind of discoveries may await among the various specimens of plants, insects and animals.